There will no doubt be many people whose first encounter with the towns and villages of the Tohoku region was in the devastating images of the tsunami following March 11. It is of course true that the Great East Japan Earthquake also inflicted great damage and loss on the northern part of the Kanto region, the rest of Japan, and indeed the world beyond, but in the case of the 'Tohoku' region in particular, this encounter seems to have been of a rather special nature for us. A certain 'region' is suddenly exposed to the nation's attention day after day, it is already an area of hopeless devastation, and there is no way of knowing how its landscapes and lifestyles were before the earthquake. This odd situation is part of the experience of the Great East Japan Earthquake. Why did this situation arise? And what kind of a place was Tohoku? Tohoku still tends to be used as a kind of catch-all for a whole range of prejudices, expectations and political phenomena. For this reason, the story of Tohoku immediately before the earthquake struck, whether directly affected by it or not, needs to be retold widely and accurately, as part of the folds of space and time interwoven by the mighty natural environment and the society, industry and transport network that humans built on it, as well as national and global geopolitics. The reason why the special issue "Tohoku on the Night Before" was chosen by the editorial board as this term's first issue is that we wanted it to serve as a premise of the above task. In the introductory dialog, the religious scholar Tetsuo Yamaori builds a conceptual picture of the Japanese archipelago through the perspectives of civilization and disaster, while the folklore scholar Shuichi Kawashima, a native of Kesennuma, presents a vivid picture of Tohoku from within the region. Following on from the three-dimensional outline of Tohoku presented in these two contrasting perspectives, Parts 1 and 2 should serve to indicate the layered nature of the multiple strata that make up the map of Tohoku. A number of episodes from the architectural field are inserted in the style of a column. Part 1 "From the Tohoku that Kenji Saw a Hundred Years Ago" traces the period from early modern times to the pre-war era, acknowledging, as it does the segmented structure in terms of physical geography that has created the place called Tohoku. Kenji Miyazawa first set eyes on the Sanriku coastline in 1931, during the last years of his life. As part of the division of labor within the Japanese empire, the Tohoku of the time was adapting to the role imposed upon it as a region that supplied foodstuffs and labor. The tsunamis that struck the Sanriku coast in the Meiji (1896) and Showa (1933) periods coincided with the years of Kenji Miyazawa's birth and death. Part 2: "Back to Tohoku Before the Earthquake" traces numerous strands in the region's post-war history from the perspectives of regional development, fishing villages and ports, transport infrastructure, the core city (Sendai), the steel industry (Kamaishi), nuclear power plant (Fukushima), family profiles, and tourism. In the Japan of the postwar era, which had lost its empire, Tohoku was given the role of hinterland to the Tokyo region and has subsequently been exposed to the competition of the global economy. Of course, as well as the image of Tohoku as a historically marginalized region, this special issue underlines the importance of its relativization. The eyes of those who have seen Tohoku and the feet of those who have lived there are pointers to the future. Also in this special issue, the front cover carries a thematic map created by Takeo Nakano indicating the region's natural topography and population; the frontispiece to Part 1 presents a bird's-eye view of Iwate, Miyagi and Fukushima prefectures from the Pacific Ocean, drawn by Hatsusaburo Yoshida in the 1930s; and Part 3 "Tohoku on March 10, 2011 (Data)" contains a number of statistical maps. 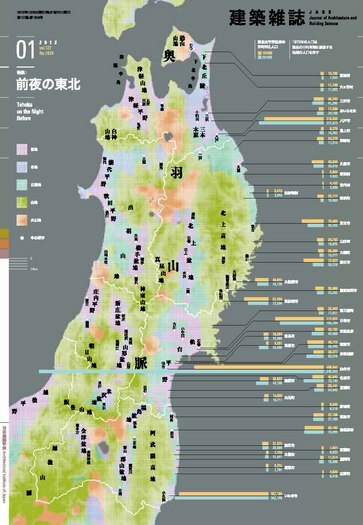 Through mutually complementary verbal mapping (dialog pieces, interviews and contributed articles) and visual mapping, I hope that this special issue will serve as a layered atlas allowing us to approach the Tohoku that is a living historical complex. Finally, I would like to emphasize, in a spirit of gratitude, that this special issue was created through the interdisciplinary collaboration of specialists from the fields of history, folklore, religious studies, geography, economics and tourism. Quite naturally, urban planning and architecture have consistently been carried out at the intersection between Tohoku's major historicogeographical contexts. The recovery from the earthquake and the society of the future, in their turn, cannot help but be founded on the same soil. The Journal of Architecture and Building Science will continue to publish special issues presenting various perspectives on the Great East Japan Earthquake, however this issue is likely to occupy a special position among them. I venture to suggest that this is because the issue, by not making direct mention of the earthquake itself, is an attempt to reveal the earthquake's significance, and will serve as a pathfinder for future special issues. I look forward to seeing readers visit Tohoku with this issue in hand, and hope that young readers particularly will tread their own paths through the disaster-hit areas before drawing new maps of Tohoku, Japan and the world. This issue has been edited by Masahiro Onuma, Naoto Nakajima, Kosei Hatsuda and Taku Kondo.